The heart of the Muffuletta is the fact that it replicates five classic Big Muff circuits from years gone by as well as a new and original JHS version, for a total of six Muff models. Looking at the pedal, there are four controls: Volume, Tone, Sustain and Mode. The “Volume” control works just like any other volume control allowing you to adjust the overall output of the pedal to your taste. The “Tone” control lets you brighten or darken your overall tone. The “Sustain” control is best understood as a gain or distortion control as it gives more distortion to the circuit. The “Mode” control lets you choose from our six different versions of the Big Muff on the fly. Looking at the “Mode” control you will see six icons around the lower 50% of the knob. Let’s take a look at each mode and why they made the cut to be in the ultimate Big Muff tribute. JHS – “2015” The JHS Muff is a JHS original take on the classic circuit. You will find this version more powerful, less compressed with a more haunting mid range. It is also the best for bass guitar. The Triangle – “1969-1970 V1” The Triangle Muff gets its name from the triangle arrangement of the knobs on the original unit. It is best known for having more low-end response and being more articulate. Famous users include Santana, David Gilmour’s Pete Cornish made pedal boards, John Lennon, Kevin Shields (My Bloody Valentine), and possibly Jimi Hendrix. The Pi – “1977-1978 V3” The Pi Muff gets its name from the instantly recognizable red Pi symbol on the top. This is not to be confused with the later redesigned NYC version released much later in 2000. It is best known for a more aggressive sound. Famous users include Frank Zappa, Billy Corgan (Smashing Pumpkins), Jack White, The Edge (U2), Beck, and Pete Townsend (The Who). The Russian – “1999-2009 V8” The Russian Muff gets its name from the “Made in Russia” text found on the back. It is best known for having less clarity and less low end. Famous users include Dan Auerbach (Black Keys), Chris Wolstenholme (Muse), and Robin Finck (Nine Inch Nails). The Civil War – “1991-1993 V7” The Civil War Muff gets its name from the old style Civil War era font found on the enclosure as well as the navy and grey colors found on many. It is best known for having more mid range, brighter overall tone and less gain. Famous users include Thurston Moore (Sonic Youth), John Fogerty, Jeff Tweedy (Wilco), Mike Mills and Peter Buck (REM). The Big Muff has an amazing history and has been used by some of the most influential guitarists ever. Never before has there been a single pedal that gives you all these different eras of it’s tone. 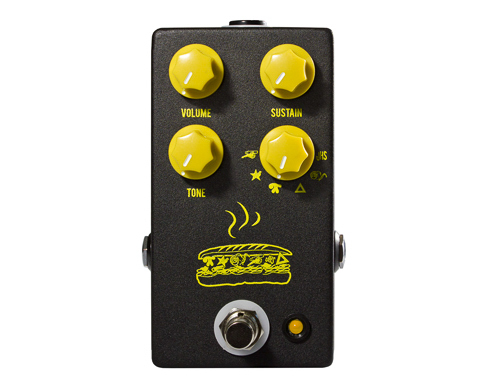 We are convinced that the Muffuletta can fit in anyone’s rig who loves dirt, distortion and fuzz, and we think it will be hard for you to disagree once you plug it in and play.